Shielding “kits manufactured by Energoform have passed a total complex of type tests. Every 3 years within the frames of certification as well as after making the significant modification to the kits design the periodical tests are carried out in the scope of type tests in order to confirm correspondence to the requirements of normative and technical documentation. Type tests of Ei-2 kits intended for protection against electromagnetic radiation are carried out in the anechoic shielded chamber. 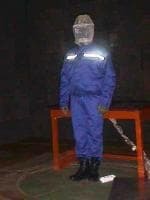 At that, the kit put on the anthropomorphic dummy is exposed to electromagnetic radiation from the powerful source (generator) with adjustable radiated frequency. The receiving antennas connected through the shielded cable to the metering device are located on the anthropomorphic dummy under the kit at breast level and under the face shield. Then the receiving antennas are tuned to the source frequency and the electromagnetic field weakening caused by the kit is detected by metering device in the frequency range of up to 22 GHz with variable step. Values of the protective properties measured parameters of shielding kit Ei-2, receiving antennas – inside the kit in the area of foreface and in the breast area. The kits of series Ep serving for protection against electrical fields of industrial frequency are subject to tests in the electromagnetic ecology laboratory at the Research Institute of Labour Medicine of the Russian Academy of Medical Sciences. The unique high-voltage test bench allows creation of the parallel-plate capacitor electrical field which makes it possible to carry out tests in more rigid conditions with the homogeneous electrostatic field acting to the phantom. Special phantoms equipped with a system of 64 equispaced mini-sensors allow obtaining of comprehensive information on protective properties of the shielding kit. Besides the shielding properties testing, the kit Ep-4(0) was subject to additional test for capability to shunt currents of up to 200A. Furthermore, it was subject to tests for thermal stability to AC heat effect in order to determine the critical parameters and improvement of the kit design. Capability to shunt alternating current has been investigated by means of a model representing a fiberglass anthropomorphic dummy pasted with aluminium foil divided into four zones Fig. 1. Each zone included one connection point (hands, feet) used for simulation of a man exposed to voltage according to two most commonly encountered schemes: hand-hand and hand-feet Fig. 2. Between the zones, depending on the scheme, the low-inductance kilo-Ohm resistor was connected simulating the rated resistance of a human body. 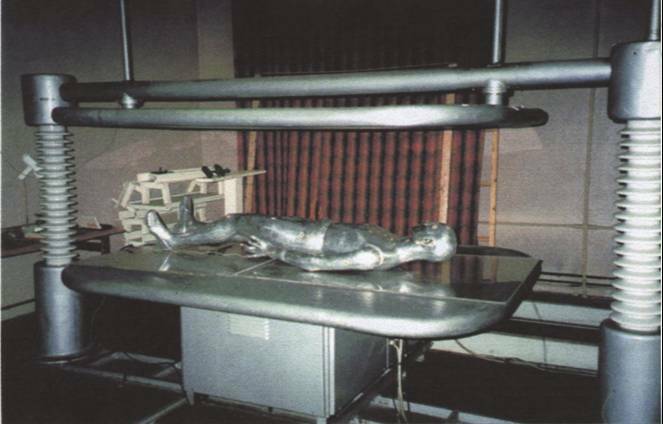 - surface of the anthropomorphic dummy was fully conductive, the human body resistance was simulated by the resistor of 1 kOhm, while the actual human body resistance can be from 10 kOhm to 100 MOhm. - a sinusoidal voltage with frequency of 50 Hz has been supplied to the sample, which corresponds to action of the current to the human being, stipulated by the magnetic (inductive) pick-up which is determined by magnetic linkage of electric-traction network remaining in operation, and, thus, takes place irrespective of time. As a result, the value of current running through the resistor simulating the human body resistance measured by oscillograph has not exceed the threshold sensitive current for frequency of 50 Hz. At current running through the kit neither inflammation nor any damage to the structural components of the kit took place. 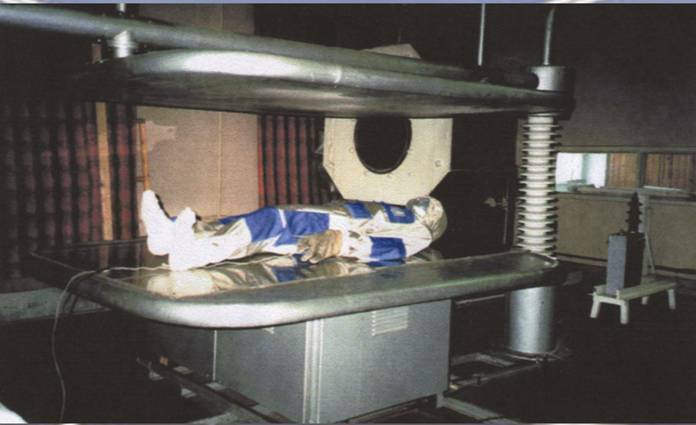 The similar test has been carried out with voltage of 27.5 kV and current of 5000 A which corresponds to exposure of a man, dressed in the kit, to the operating voltage of AC catenaries. At that, actuation of protection with 0.02 sec cutoff (1 period of industrial frequency) was simulated. The current through the resistor was 1.5A and turned out to be equal to the threshold fibrillation current in pulse mode. No damage to the kit occurred. Then, by means of a special bench, the currents of up to 100 A, 50 Hz, have been supplied to the kit. Heating of the kit was detected by thermal imager, and heating of the anthropomorphic dummy surface – by the thermal couple. The protective kit has shown capability to shunt current of 50 A for 1.5 min, 100 A – for 30 sec without burning the user and damage to structural components. That is why, Ep-4(0) can effectively and reliably protect a user against exposure to the induced AC voltage, 50 Hz, without inflicting any discomfort and burns while carrying out works on AC railway catenaries and overhead transmission lines with voltage class of 110 kV and higher, as well as on overhead ground-wire cables. As per the results of the last experience it is possible to say that the protective kit Ep-4(0) has potential capability to protect the user when exposed to the operating voltage of 27.5 kV and current of 5 kA with corresponding follow-up of design and application procedure. In the last years the universal shielding kits of Ep series intended for simultaneous protection against electrical field, induced voltage and thermal risks have been tested for stability to electric arc and open flame. The tests were carried out on the Arc-Man® installation. In manufacturing of such kit the Nomex® fabric featuring a number of constant protective properties has been used as an external thermal resistant layer. Tests for stability to the electric arc exposure have shown the result of not less than 18 calories per square centimeter. Then the design of these suits has been finished on the special Thermo-man® installation. In condition of standard 4-second exposure to the open flame the kit samples have shown only 1-2% of second-degree burns. These results are indicative of high level of protection against electric arc and of high potential of the unique models. 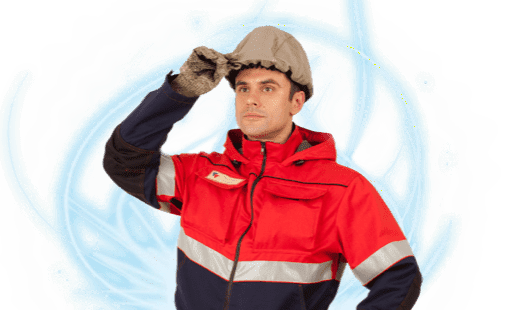 Currently, as per the results of tests and evaluations, the conductive clothing manufactured by Energoform NPO CJSC are certified by the Authorities on certification of personal protective equipment of GosStandard of Russia. The sanitation-and-epidemiological conclusion of the Department for State Sanitary and Epidemiological Supervision of the Ministry of Health of the Russian Federation has been given to the kits. In the course of production cycle each kit, including all its components, is subject to acceptance tests by means of measurement of its electrical resistance. According to the operation instructions, such tests should be periodically (once a year) repeated in the course of the kits usage in order to confirm correspondence of their protective properties to the specified requirements.